Sept. 24, 2013: Anticipation is building as Comet ISON approaches the sun for a close encounter on Thanksgiving Day (Nov. 28). No one knows if the blast of solar heating ISON receives will turn it into one of the finest comets in years--or destroy the icy visitor from the outer solar system. 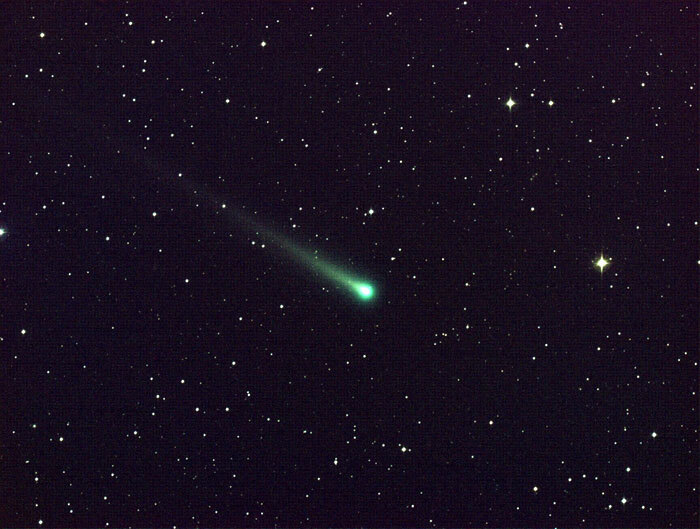 Astronomer Carey Lisse, the head of NASA's Comet ISON Observing Campaign, hopes that "every telescope on Earth will be trained on the comet in October and November." He may get his wish. As September comes to an end, amateur astronomers around the world are already monitoring the comet. 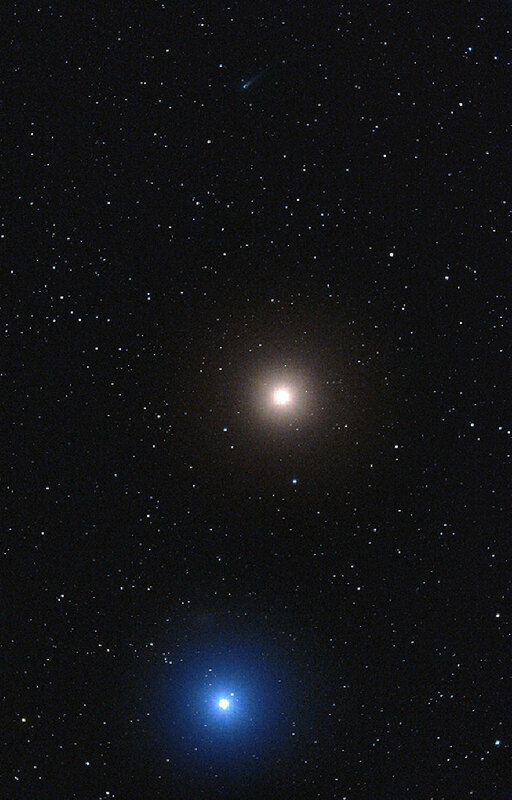 "Comet ISON is approaching Mars in the pre-dawn sky," explains Lisse. "It is invisible to the naked eye, but within reach of backyard telescopes." In mid-September, the approaching comet was glowing like a star of 14th magnitude. That's dimmer than some forecasters expected. "Certainly we would love it to be a couple of magnitudes brighter right now," says researcher Karl Battams of the Naval Research Lab in Washington, D.C.,"but it's doing just fine. I'd say it's still on course to become a very eye-catching object." Battams is especially optimistic about NASA's twin STEREO probes and the NASA/ESA Solar and Heliospheric Observatory. Those three spacecraft are equipped with coronagraphs--devices which cover the blinding disk of the sun to produce an artificial eclipse. The coronagraphs will be able to see ISON at its brightest when it is making its closest approach to the sun on Thanksgiving. If ISON survives its brush with solar fire, sky watchers on Earth might get an eye-full as well. 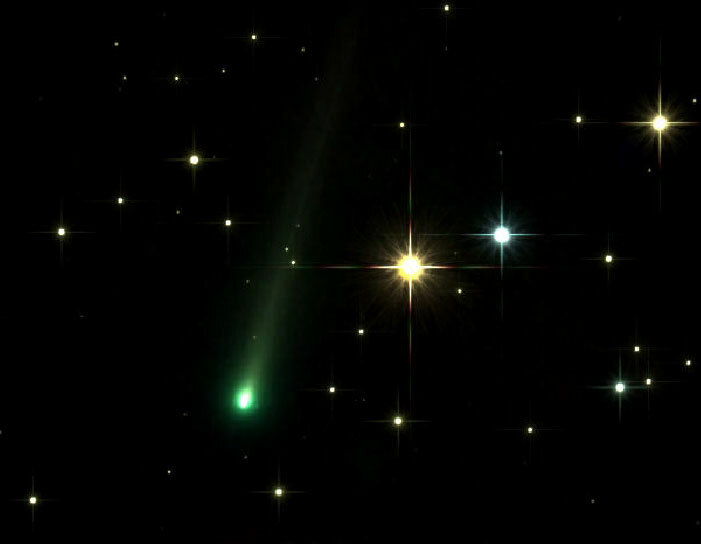 Based on the latest images, internationally known comet expert John Bortle says "ISON appears likely to survive the in-bound leg of its journey all the way to the Sun. It will probably brighten more slowly than all the early hype led the public to believe. Nevertheless, Comet ISON should very briefly become exceptionally bright, at least rivaling the planet Venus in the hours preceding its closest approach to the sun." After Thanksgiving (Nov 28th), Comet ISON will emerge from the sun's glare well-positioned for observers in the northern hemisphere. 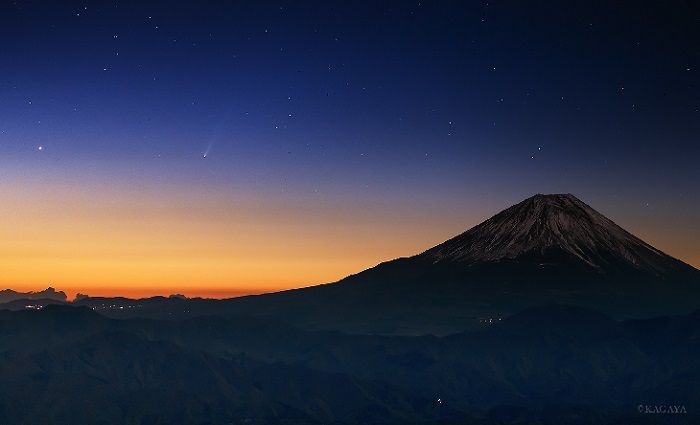 The comet's tail will likely be visible to the naked-eye in both the morning and evening sky throughout December 2013. A useful point of comparison is Comet Lovejoy, which put on a grand show after it brushed the sun in 2011. People in the southern hemisphere still remember the comet's tail stretching halfway across the night sky. 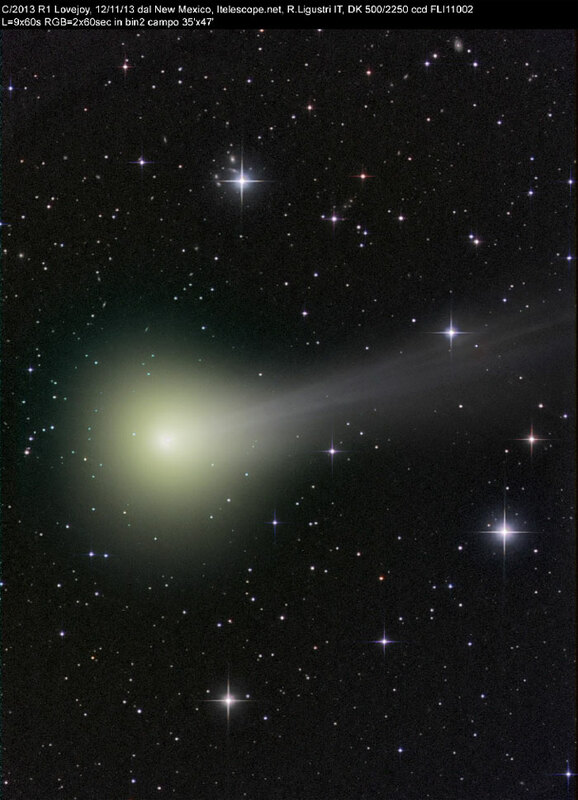 Judging from the brightness of Comet ISON, Matthew Knight of the Lowell Observatory believes that “ISON is likely a few times bigger than Lovejoy was, so I am optimistic that Comet ISON will become an impressive sungrazer." Because this is Comet ISON's first visit to the inner solar system, no one can say for sure what will happen. Comets are unpredictable, capable of fizzling at the last minute even after months of promising activity. Battams, who has been "burned" before by sungrazing comets, cautions that "at no point in the next couple of months are we going to know if Comet ISON will survive or not until we actually observe it with our own eyes." "Observations from amateur astronomers are really valuable pieces of the puzzle for us," adds Battams. "They help us to see how the comet is evolving." 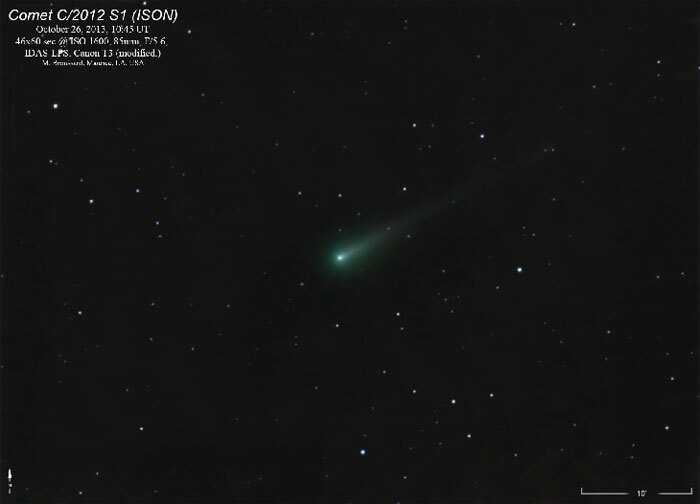 The NASA Comet ISON Observing Campaign aims to get as many eyes on ISON as possible. To learn how you can help, visit http://isoncampaign.org. 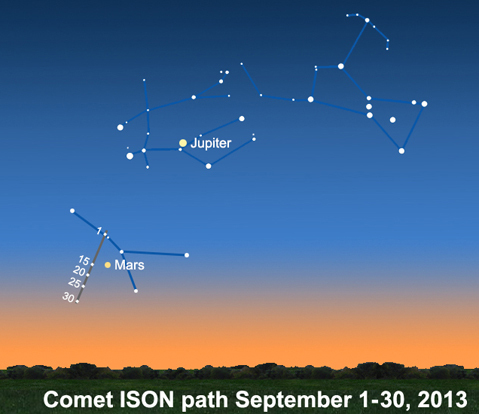 On October 1st, Comet ISON will pass closer to Mars than it ever will to Earth. The Red Planet’s rovers and orbiters are ready to send home postcards of the event. In one week the (in)famous Comet ISON will make its closest approach to Mars, flying just 10.8 million km (6.7 million miles) from its surface on October 1st. All Martian eyes will be watching, including Curiosity’s, though a postcard-perfect picture is far from guaranteed. Curiosity and Opportunity will both be watching as ISON passes overhead, but the most likely detection will come from the HiRISE camera aboard NASA’s Mars Reconnaissance Orbiter. That camera resolves 1-meter (3-foot) features on the Martian surface, but the unprecedented sharpness of its daylit landscapes doesn’t necessarily mean it will do well on a dim glow in darkest space several million km away. 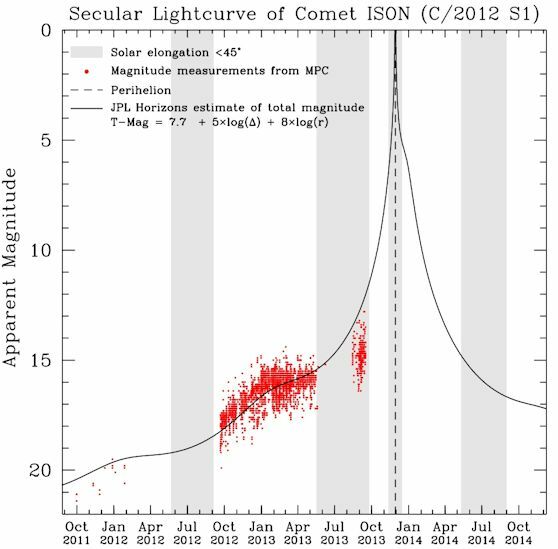 NASA already planned a test observation for August 20th, and unfortunately (but not unexpectedly), Comet ISON remained just below the detection threshold. MRO is also planning to look during another three observing windows: on September 29th, and October 1st and 2nd. Mars Express was scheduled to start looking yesterday (September 23rd), and the Swift spacecraft’s Ultraviolet/Optical Telescope will take observations on October 1st. For the full list of planned professional observations of Comet ISON, see CIOC’s Observation Calendar. Regardless of how the observations of Comet ISON turn out next Monday, they promise to be good practice for Comet Siding Spring, which will come 216 times closer (within 110,000 km of the Red Planet) in October 2014. Nov. 19th: ISON will pass closest to Mercury, with Messenger as its witness. 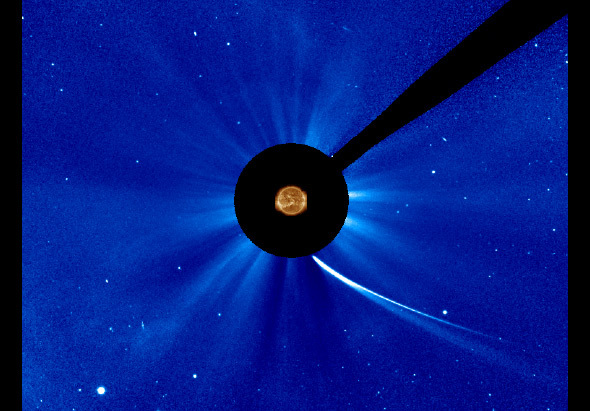 Nov. 28th: Comet ISON whips through the outer solar corona, passing within 1.2 million km of the Sun’s visible surface. Dec. 26th: Assuming the comet survives its graze past the Sun, it’ll pass 64.2 million km from Earth (167 times farther than the Moon). A colossal NASA balloon is poised to carry a free-hanging gondola sky-high on a mission to take a gander at celestial grandeur: Comet ISON. Weather permitting, NASA's Balloon Rapid Response for Comet ISON (BRRISON) gondola and science instruments are to ascend from the space agency's Scientific Balloon Facility in Fort Sumner, N.M., possibly by Sunday (Sept. 29). The one-day balloon mission's target is Comet ISON, an incoming comet that some scientists have billed as a potential "comet of the century" because it could flare up to spectacular brilliance after a close flyby of the sun in late November. Along with a 0.8-meter telescope, NASA's reusable BRRISON balloon gondola will carry infrared and near-ultraviolet/visible imaging gear, along with fine-steering mirror technology to obtain high pointing stability while observing Comet ISON. 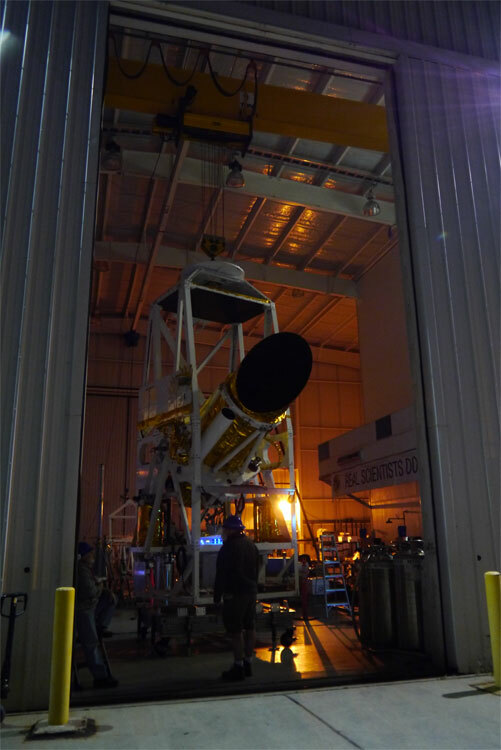 This photo shows the Comet ISON-hunting BRRISON balloon gondola pointing out the door of the hangar for a night time pointing test, to acquire images of stars and planets with both instruments. The instrument will ride a giant NASA balloon to track Comet ISON, the potential "comet of the century." Reports from Fort Sumner by the BRRISON team are upbeat. 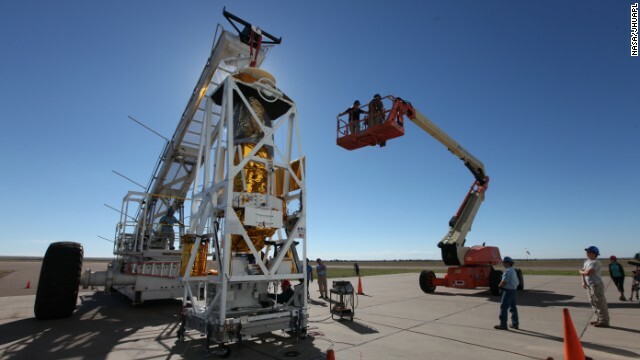 The team has had a series of successful pointing tests with the gondola hanging from a crane inside an opened door hangar and with project instruments acquiring test shots of star fields and planets, said Andrew Cheng, BRRISON principal investigator and chief scientist in the Space Department at Johns Hopkins Applied Physics Laboratory (APL) in Laurel, Md. The team had hoped to launch BRRISON by this week, although weather issues at the New Mexico launch site could force a delay to the weekend. "We did come here to the launch site a week late because of problems with the infrared camera, but they've been overcome," Cheng told SPACE.com. "I expect we’ll be flight-ready by Thursday this week and may fly Friday. I'm concerned about the weather … chances of being able to launch Friday or Saturday are poor, and Sunday may be a better bet," he said. The BRRISON science balloon will fly on a zero-pressure balloon. It is the first NASA Planetary Science Division balloon mission to observe a comet. The large helium-filled balloon will carry the instrument-carrying gondola to near space, soaring up to 120,000 feet (36,576 m) altitude. That’s almost 23 miles (37 kilometers) above the Earth. By sending the balloon to that height, the gondola instruments are flying above most of the atmosphere and they should be able to view Comet ISON more clearly. Young told SPACE.com that the team has exercised the gondola’s coarse pointing system and a fine steering mirror during a "hang test" on Sept. 22. It was a gusty night, Young said, and the line of sight was limited, but the gondola’s Altazimuth (ALT/AZ) mounts permitted precise motion of the telescope tube in vertical (altitude) and horizontal (azimuth) directions. ALT/AZ motors kept a test source well within the desired field of view. 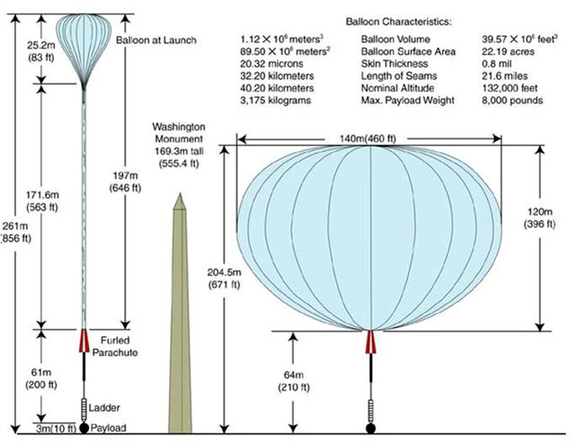 NASA's giant BRRISON project balloon will be taller than the Washington Monument at sea level when it launches to hunt Comet ISON. Once it has reached its goal altitude — for this mission, around 120,000 feet — the balloon will expand to a size larger than a football field. A guide camera was able to find and "centroid" — average position of an object — on a star at about 100 frames per second, and most of the motion of the buffeted telescope was corrected for, Young said. "We hope that the conditions in the stratosphere will be less severe," Young said, enabling "better image quality to help us get more accurate centroids and milder wind buffeting to overcome," he told SPACE.com. Comet ISON is an Oort cloud comet and scientists suspect the celestial wanderer is making its first — and potentially last — voyage into the inner solar system. The comet was discovered in September 2012 and is a sun-grazer, meaning it will pass extremely close by the sun on Nov. 28. 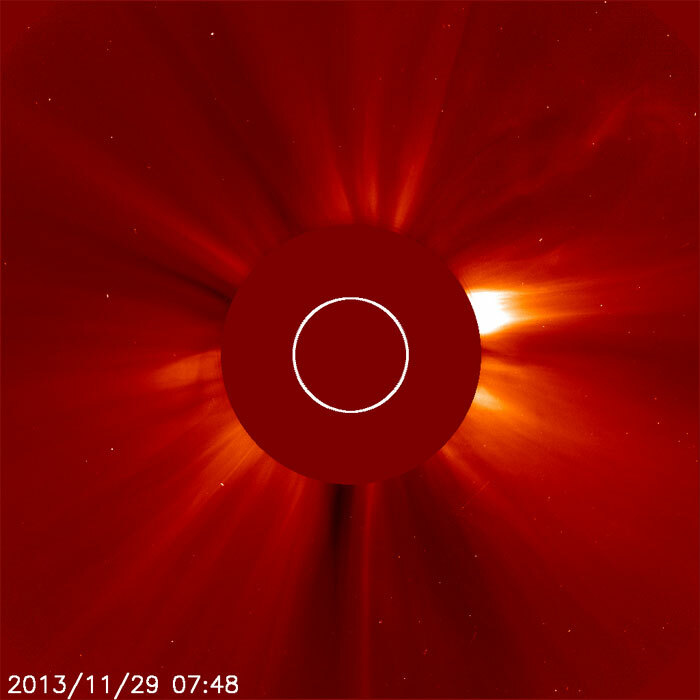 The sun's gravity may well tear Comet ISON apart by tidal forces. But BRRISON will observe Comet ISON before it plunges close to the sun, while it is still outside Earth's orbit distance. During its observing trek, data gleaned by BRRISON will be recorded onboard and analyzed after landing. In addition to observing Comet ISON, scientists plan to have BRRISON observe several other targets during its flight, including Comet Encke; moons of Jupiter; and the hydrated (water-bearing) asteroids 24 Themis and 130 Elektra. How does the composition of an Oort cloud comet compare with a Kuiper Belt comet? What are the chemical processes that lead to complex organic molecules in regions of star and planet formation? Were there systematic chemical or isotopic gradients in early solar nebula? How did Earth get its water and other volatiles? BRISSON was built and managed by Johns Hopkins University Applied Physics Laboratory in collaboration with NASA’s Glenn Research Center, NASA's Balloon Program Office, the Columbia Scientific Balloon Facility and the Southwest Research Institute. Exploring the heavens with spaceships and fancy orbiting telescopes like the Hubble is pretty routine stuff for NASA. But the space agency is going low-tech to get a good look at an eagerly anticipated comet.The space agency plans to launch a balloon -- yes, a balloon -- to study Comet ISON, the much-hyped comet that many hope will put on a big sky show in coming months. Astronomers are scrambling to figure out ways to learn more about the comet, and that's where the balloon comes in. This isn't the kind of balloon you buy for kids at a party store, but they do have some things in common. NASA says its scientific balloons are made of polyethylene film like the material in plastic bags, and it will be filled with helium, just like a party balloon. But the NASA balloons can carry a payload weighing 8,000 pounds (3,600 kilograms), or about the weight of three small cars. It has a gondola to carry the instruments. Some similar balloons can fly up to 26 miles high and stay for up to two weeks. The 671-foot-tall balloon that will monitor ISON is called BRRISON, or Balloon Rapid Response for ISON. According to NASA, it will float about 120,000 feet above Earth to observe the comet -- and other science targets -- using a telescope and other instruments. It is expected to stay up from nine to 11 hours. "By ascending above 99.5% of the Earth's atmosphere, BRRISON will be able to study the materials within the comet," Andy Cheng, principal investigator, said on BRISSON's website. "It's possible that water and organic chemicals on comets may have played an important role in the evolution of life on Earth." The launch, from NASA's Columbia Scientific Balloon Facility in Fort Sumner, New Mexico, is targeted for 8 p.m. ET on Saturday, weather permitting. 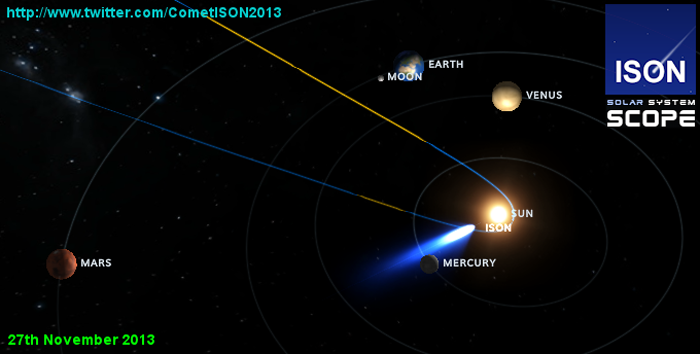 Comet ISON is nearing Mars on its way toward the sun and will fly about 730,000 miles above the sun's surface on November 8. If it survives, it could brighten and put on a big show as it passes Earth's orbit on its way back to the outer reaches of the solar system. Comet enthusiasts hope they will be able to see it without binoculars or telescopes. Its closest approach to Earth would be December 26, and it could be visible from the Northern Hemisphere for weeks in early 2014. The comet was discovered by Russian astronomers Vitali Nevski and Artyom Novichonok in September 2012. It is named after their night-sky survey program, the International Scientific Optical Network, a group of observatories in 10 countries organized to track objects in space. Amateur astronomers already are posting pictures and making calculations about the comet's future. For those who want to try to track Comet ISON themselves, NASA has some tips on its Comet ISON website. Scientists managing the High-Resolution Imaging Science Experiment (HiRISE) camera aboard NASA’s Mars Reconnaissance Orbiter (MRO) have released their first observations of the incoming Comet ISON. The MRO was commanded to turn away its perpetual Mars-ward gaze and point into deep space to capture its own snapshot of the famous comet. ISON is currently making its closest approach to the red planet, passing just 7 million miles from its surface. The first raw images were snapped on Sept. 29 when the object was 8 million miles from the planet and more images (taken on Oct. 1 and Oct. 2) are currently being processed. The four initial observations reveal a fuzzy cometary object moving relative to background stars. 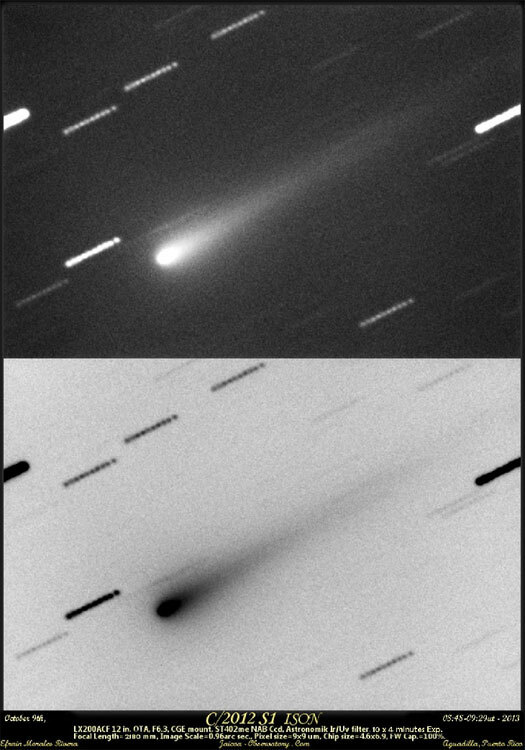 Detail is lacking as the comet is still too distant, but these observations are useful to gauge how the brightness of the object compares to predicted values. So far, ISON is at the “low end” of predicted brightness values. The comet is currently 150 million miles from the sun, but as it falls deeper and deeper into the sun’s gravitational well, ISON will likely brighten as icy volatiles from the comet’s nucleus heat up and erupt into space. The addition of gas and dust should cause the comet’s coma to increase in size. But will this be the comet of the century? Many astronomers are becoming increasingly skeptical of that fact. Comet ISON was discovered in Sept. 2012 and its orbit initially caused some excitement. The object appears to be a “virgin” comet from the hypothesized Oort Cloud that is thought to contain billions of icy objects that intermittently drop into the inner solar system as comets. The pristine nature of Comet ISON led many to believe that once heated by the sun’s heat, it could erupt, making this a historic event. Although notable, ISON appears to be holding its own and may not erupt into the “daytime” comet we were hoping for. This “sungrazer” will come within 724,000 miles of the sun on Nov. 28, so it will be interesting to see whether the comet’s nucleus survives its fiery descent. Astrophotographer Adam Block captured this view of Comet ISON on the morning of Oct. 8 with the 0.8-meter Schulman Telescope at the University of Arizona SkyCenter atop Mount Lemmon. It's not at all clear whether Comet ISON will become "the comet of the century," as skywatchers hoped a year ago, but it's certainly become a beautiful sight for photographers with the right kind of telescope. Adam Block captured a stunner on Tuesday morning, just before sunrise, using the 0.8-meter Schulman Telescope at the University of Arizona's SkyCenter atop Mount Lemmon. Block's picture reveals ISON's greenish coma, trailed by a long, straight tail. 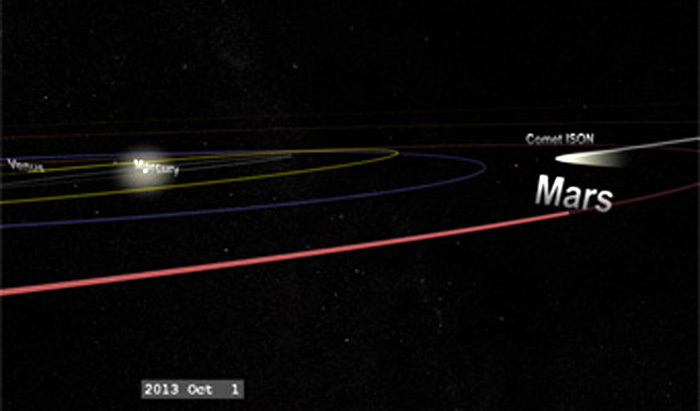 The comet is zooming within the orbit of Mars, heading toward a crucial rendezvous with the sun on Nov. 28. "I am certain more images of this will be coming out shortly as it increases in brightness during its dive toward the sun," Block wrote in an email. "Here is hoping it survives that rendezvous and emerges as something spectacular on the other side! Although its future is questionable ... being prepared is always a sure thing to take advantage of quickly changing conditions." Austrian astrophotographer Michael Jäger also captured a green-tinted glimpse of the comet. "ISON's green color comes from the gases surrounding its icy nucleus," SpaceWeather.com's Tony Phillips wrote. "Jets spewing from the comet's core probably contain cyanogen (CN: a poisonous gas found in many comets) and diatomic carbon (C2). Both substances glow green when illuminated by sunlight in the near-vacuum of space." The comet is still too dim to see with the naked eye, but if you have the right kind of telescope, Phillips says you can see it rising alongside Mars in the eastern sky, just before dawn. SpaceWeather.com provides the coordinates and additional viewing suggestions. Some astronomers say there's a good chance that ISON will fizzle out. But if it doesn't break apart and survives its 724,000-mile (1.16 million-kilometer) solar encounter, it just might meet Block's expectations. Calling it the comet of the century is probably too presumptuous — but "comet of the year"? Maybe. Stay tuned. 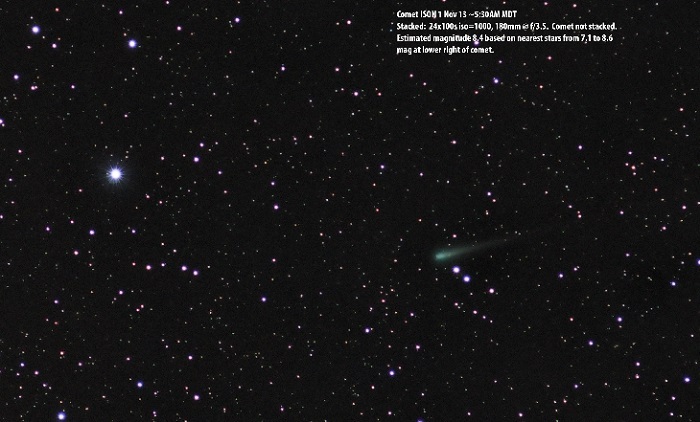 Michael Jäger took this picture of Comet ISON on Oct. 5 from Weissenkirchen, Austria. For more about Jäger, check out CometPieces.at. Überlebt Komet ISON (C/2012 S1) den Perihel ? On 2013 November 28 Comet ISON (C/2012 S1) will pass by the Sun with a perihelion distance of 2.7 solar radii. Understanding the possible outcomes for the comet's response to such a close passage by the Sun is important for planning observational campaigns and for inferring ISON's physical properties. We present new numerical simulations and interpret them in context with the historical track record of comet disruptions and of sungrazing comet behavior. Historical data suggest that sizes below ~200 m are susceptible to destruction by sublimation driven mass loss, while we find that for ISON's perihelion distance, densities lower than 0.1 g cm–3 are required to tidally disrupt a retrograde or non-spinning body. Such low densities are substantially below the range of the best-determined comet nucleus densities, though dynamically new comets such as ISON have few measurements of physical properties. Disruption may occur for prograde rotation at densities up to 0.7 g cm–3, with the chances of disruption increasing for lower density, faster prograde rotation, and increasing elongation of the nucleus. Given current constraints on ISON's nucleus properties and the typically determined values for these properties among all comets, we find tidal disruption to be unlikely unless other factors (e.g., spin-up via torquing) affect ISON substantially. Whether or not disruption occurs, the largest remnant must be big enough to survive subsequent mass loss due to sublimation in order for ISON to remain a viable comet well after perihelion. 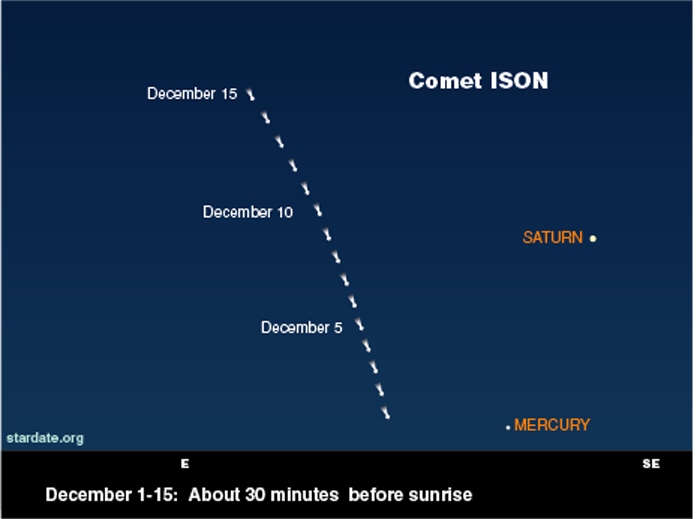 HOW TO FIND COMET ISON: How do you find Comet ISON? Wake up before dawn, face east, and follow the "double star." 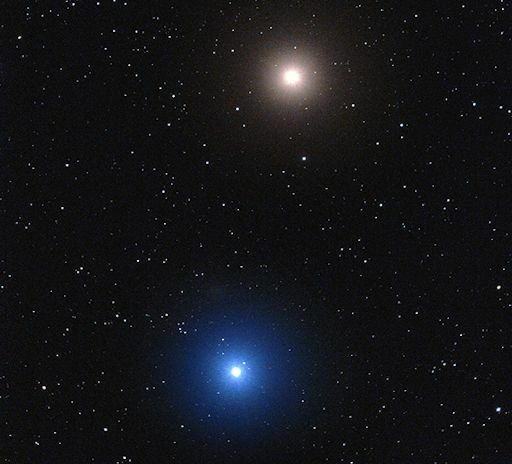 Rising about three hours before the sun, red Mars and blue-white Regulus have converged to form a bright pair separated by only 1o. Martin Gembec photographed the duo from the Czech Republic before daybreak on Oct. 14th. To find Comet ISON, take a look at the full-sized image. The comet is just above Mars. On Nov. 28th, Comet ISON could become spectacularly bright when it flies through the atmosphere of the sun. At the moment, though, it is still far away (near Mars) and faint. Visibility requires a telescope. Amateur astronomers, if you have a GOTO telescope, enter these coordinates, or just find the "double star" and draw a line between Regulus and Mars. It leads to ISON. A new image of the sunward-plunging comet ISON suggests that the comet is intact despite some predictions that the fragile icy nucleus might disintegrate as the sun warms it. The comet will pass closest to the sun on Nov. 28. In this image taken on Oct. 9, 2013, the comet's solid nucleus is unresolved because it is so small. If the nucleus broke apart then Hubble would have likely seen evidence for multiple fragments. A new image of the sunward plunging comet ISON suggests that the comet is intact despite some predictions that the fragile icy nucleus might disintegrate as the sun warms it. The comet will pass closest to the sun on Nov. 28. 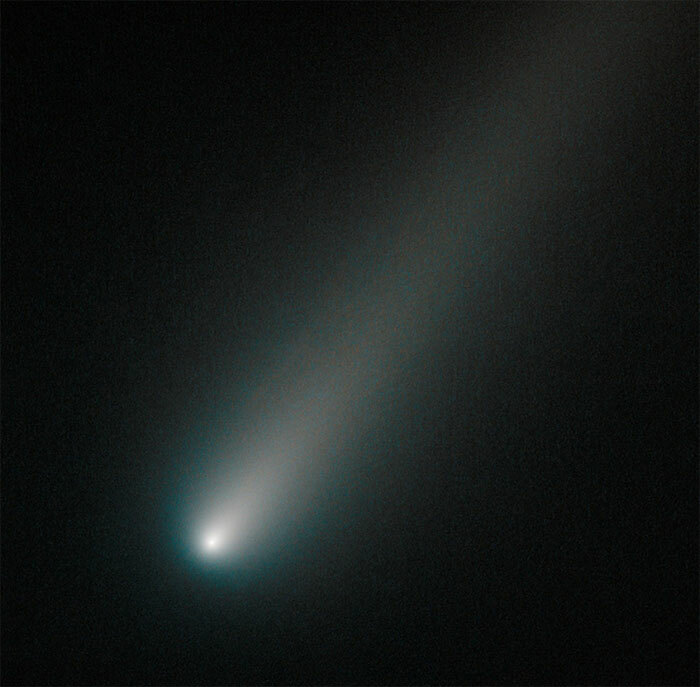 In this NASA Hubble Space Telescope image taken on Oct. 9, the comet's solid nucleus is unresolved because it is so small. If the nucleus broke apart then Hubble would have likely seen evidence for multiple fragments. Moreover, the coma or head surrounding the comet's nucleus is symmetric and smooth. This would probably not be the case if clusters of smaller fragments were flying along. What's more, a polar jet of dust first seen in Hubble images taken in April is no longer visible and may have turned off. This color composite image was assembled using two filters. The comet's coma appears cyan, a greenish-blue color due to gas, while the tail is reddish due to dust streaming off the nucleus. The tail forms as dust particles are pushed away from the nucleus by the pressure of sunlight. The comet was inside Mars’ orbit and 177 million miles from Earth when photographed. Comet ISON is predicted to make its closest approach to Earth on Dec. 26, at a distance of 39.9 million miles. Luminance data was captured using a 20 Meade RCX400 Max Mount and SBIG STL-1001e with 1 hour of 60 second exposures. The color data was simultaneously obtained using an SBIG ST-4000 XCM on a Televue Np-101is with 5 minute exposures. The images were stacked while aligning on the stars and then again while aligning on the comet. The final image was created by compositing the stacked images. 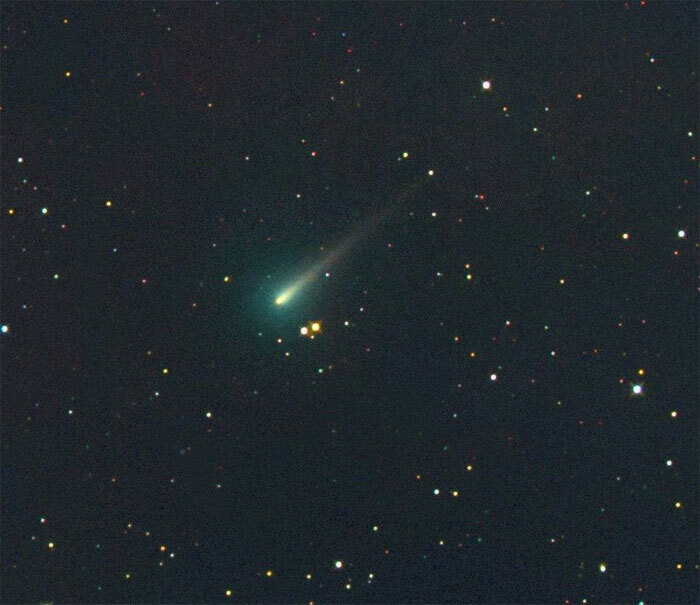 ISON was faint but was obvious on 100 sec exposures. Brightest star on left is magnitude 4.1 Sigma Leonis. Stars were aligned but no comet in this stack of 24 images. This exaggerates the size of the comets coma. Taken by Jim Wakefield on November 1, 2013 @ Nov 1, 2013, 5:30am PST, LX200 10, guided w/80ED, single 6 minute exposure, post processed w/Star Tools. Comet ISON shines in this five-minute exposure taken at NASA's Marshall Space Flight Center on Nov. 8 at 5:40 a.m. EST. The image has a field of view of roughly 1.5 degrees by 1 degree and was captured using a color CCD camera attached to a 14" telescope located at Marshall. 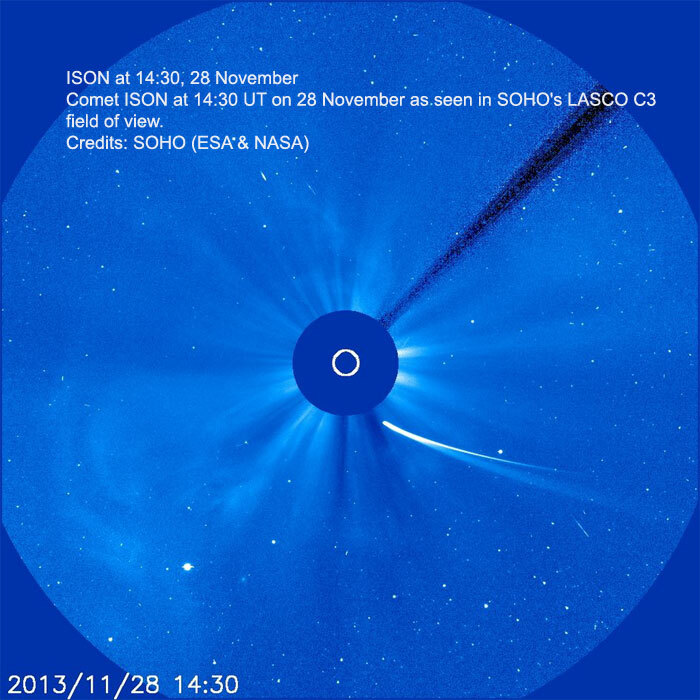 At the time of this picture, Comet ISON was 97 million miles from Earth, heading toward a close encounter with the sun on Nov. 28. Located in the constellation of Virgo, it is now visible in a good pair of binoculars. Comet 2012 S1 (ISON) appears to be finally getting its act together and looking like a comet should as it heads for a hot date with the Sun on 28 November. 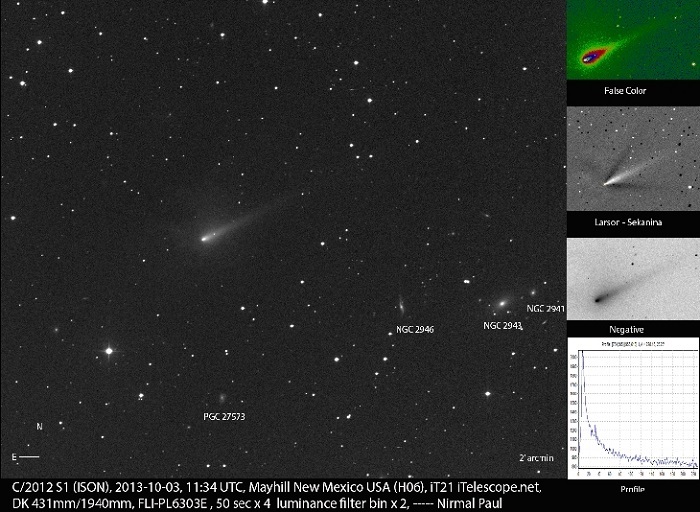 ISON is now shining at magnitude +8, making it visible as a soft glow in 10x50 binoculars. The comet's tail has lengthened to at least half a degree, the width of the full Moon and the coma is around five to seven arcminutes across. Astronomers report that the rate of ISON's gas production has increased rapidly over the last several days which, according to one scientist, could indicate melting of deeper layers of ice. ISON was reported to be intact still last month, so this enhanced activity does not appear to be the result of any disruption or breaking up of the comet, astronomers added. ISON is a morning object right now in Virgo and this coming morning, 12th to 13th, it will be within four degree of Porrima (gamma Virginis, mag. +2.7). ISON rises around 3.30am GMT (London), almost four hours ahead of the Sun, and by the end of the astronomical night at 5.15am (Sun 18 degrees below the horizon) it has climbed 15 degrees clear of the east-north-east horizon. 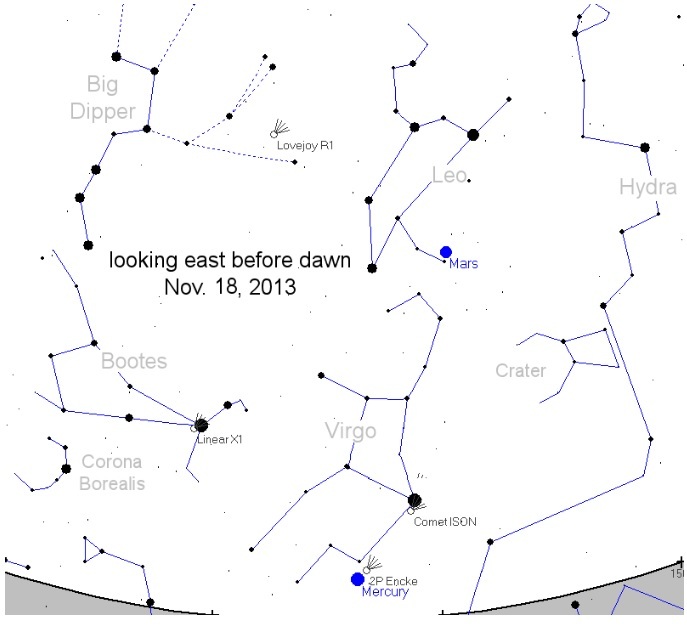 By the time the morning twilight curtails further observation around 6am, ISON is 20 degrees up. Let's hope for clear skies in the next week or so as soon after mid-month it becomes too low over the horizon to observe as it zooms east through Virgo, passing very close to Spica on the morning of 18 November. If ISON survives perihelion passage on 28 November it will reappear in early December into bright morning skies in Scorpius. 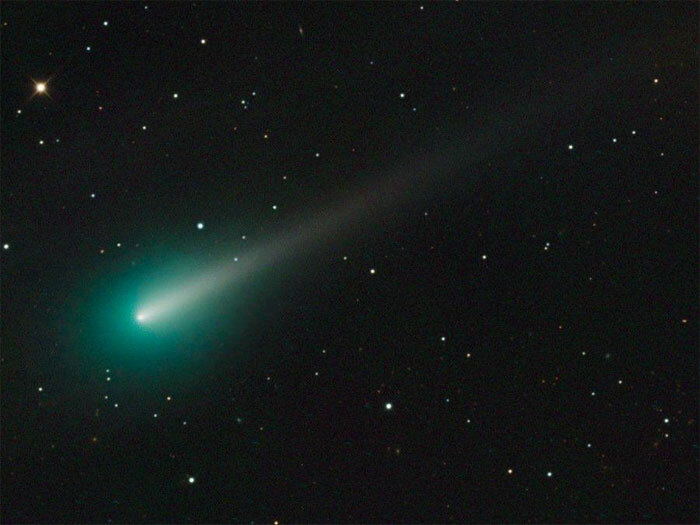 A sudden brightening of the comet Ison this week means now might be your best chance to see the beautiful green "sungrazer," as NASA is warning the comet may not last. "If you want to see Ison with your own eyes, do it now," said a blog post on the website of NASA's Comet Ison observing campaign Friday. "We can not and do not guarantee that it will survive the next few weeks and become naked-eye visible in our night skies." This week, the comet suddenly had an "outburst" — an event where it jumped dramatically in brightness — so that it may now already be visible with the naked eye in some places. "It's naked eye if you're deep, deep in the country, the sky is pristine and clear and your eyes are fantastically good," said Robyn Foret, chair of the education and public outreach committee for the Royal Astronomical Society of Canada, in an interview from Calgary Friday. "That said, with a good pair of binoculars on your deck, if you know where to look in the sky, you will see it." Right now, astronomers recommend looking for the comet just above the star Spica in the constellation Virgo in the southeast sky, just before dawn. 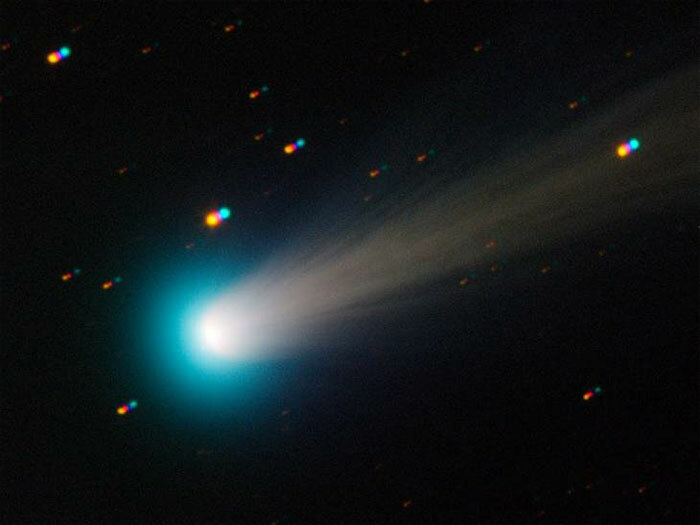 Comets are often described as "cosmic snowballs," as they are made of frozen gas, rock and dust. When their orbits bring them close to a star such as the sun, they heat up, causing some of the gas and dust to spew from the surface, forming a "coma," or atmosphere, that makes them look like fuzzy balls in the sky. As they get closer to a star and heat up even more, water ice and other heavier gases start to evaporate, making them look bigger and brighter. Sometimes, the coma may expand into a long, beautiful tail pointing away from the sun. Comet Ison is currently closer to the sun than the Earth is and is getting nearer the sun each day. The "sungrazer" — the name given to comets that pass very close to the sun, becoming very bright -— is expected to brush past our nearest star a distance of 1.6 million kilometres on Nov. 28. That distance is just a little bit bigger than the sun's own diameter. When Ison was first detected near the orbit of Jupiter last year, astronomers predicted it might become one of the brightest comet ever seen. However, so far it has not brightened as much as expected over the course of its sunward journey. As the comet approaches the sun, it is expected to keep brightening. But that doesn't mean it will be easier to see. "Because it's moving closer to the sun, it moves closer and closer to where the sun is in the sky," Foret said. While it is now visible a fair distance above the horizon before dawn, it will get lower and lower in the sky each day, until it is too close to the sun to view safely. "If you accidentally look at the sun through a pair of binoculars, it can have lifelong negative effects on your vision," Foret warned. NASA's Comet Ison Observing Campaign says you have "maybe a handful more days" to see the comet before it gets lost in the sun's glare. If the comet survives its close encounter with the sun on Nov. 28, it will be at its brightest in the month of December, as it moves away from the sun and may be "spectacular" at that point, Foret predicts. But comets sometimes break up into pieces as they get close to the sun, and Foret said it wouldn’t be surprising if Ison does just that. In fact, NASA suggests it's possible that the comet's recent brightening may have been caused by the comet's solid core fragmenting. "Given that ISON's nucleus is shrouded in such a tremendous volume of light-scattering dust and gas right now, it will be almost impossible to determine this for at least a few day," said the NASA blog post. If the comet's core is already breaking up, it is unlikely that any piece will survive the comet's close approach to the sun, since a chunk would have to be at least 200 metres wide to survive, NASA says. It estimates that as of this week, the comet was estimated to be 500 metres to two kilometres in diameter. That means those who want to see Comet Ison shouldn't wait. Foret said comets are always worth looking for, even if you've seen a comet before, because they all look different, especially their tails. "Sometimes, comets appear to have two tails; sometimes, they'll have what looks like a tail in front of comet." He himself hasn't had a chance to see Ison yet. "I'm in Calgary, it's that time of year," he said. "It's very nice and cloudy in the east the past few days. But we're hopeful we'll get a break." The tail is so long, he couldn't fit the whole thing in the field of view. How long is it? 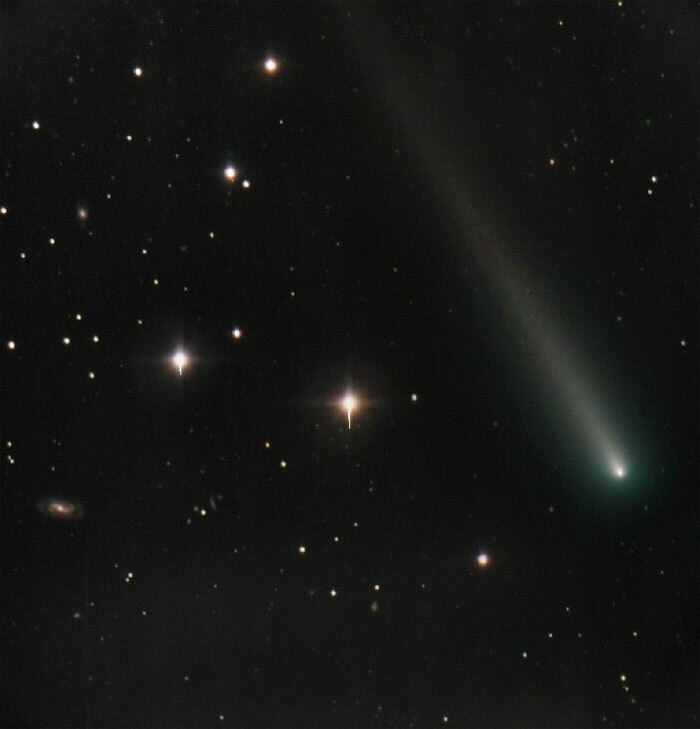 Comet ISON's tail extends more than 8 million kilometers behind the comet's nucleus. For comparison, that's 21 times the distance between Earth and the Moon. Because so much gas and dust is spewing from the comet's core, it is impossible to see clearly what caused Comet ISON's outburst on Nov. 13-14. One possibility is that fresh veins of ice are opening up in the comet's nucleus, vaporizing furiously as ISON approaches the sun. Another possibility is that the nucleus has completely fragmented. "If so, it will still be several days before we know for sure," says Karl Battams, an astronomer with NASA's Comet ISON Observing Campaign. "When comet nuclei fall apart, it’s not like a shrapnel-laden explosion. Instead, the chunks slowly drift apart at slightly different speeds. Given that ISON’s nucleus is shrouded in such a tremendous volume of light-scattering dust and gas right now, it will be almost impossible to determine this for at least a few days and perhaps not until the comet reaches the field of view of NASA's STEREO HI-1A instrument on November 21, 2013. We will have to wait for the chunks to drift apart a sufficient distance, assuming they don't crumble first." In short, no one knows for sure what is happening to Comet ISON. This could be the comet's death throes--or just the first of many brightening events the comet experiences as it plunges toward the sun for a close encounter on Thanksgiving Day (Nov. 28th). "The tail of the comet stretches more than 7o across the sky," says Jäger. It's almost as wide as the bowl of the Big Dipper. Physically, ISON's tail is about 12 times wider than the sun. So, when the head of ISON plunges into the sun's atmosphere on Nov. 28th, more than 15 million kilometers of the comet's tail will still be jutting into space behind it. 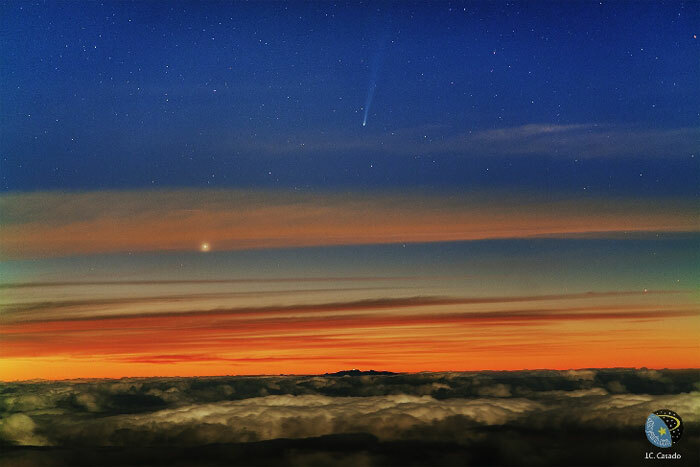 A composite image from the European Southern Observatory's TRAPPIST telescope in Chile shows Comet ISON streaking toward the sun on Nov. 15. The image combines four different 30-second exposures of the moving comet in different wavelengths. That's why the background stars appear as multicolored, slightly misaligned dots. 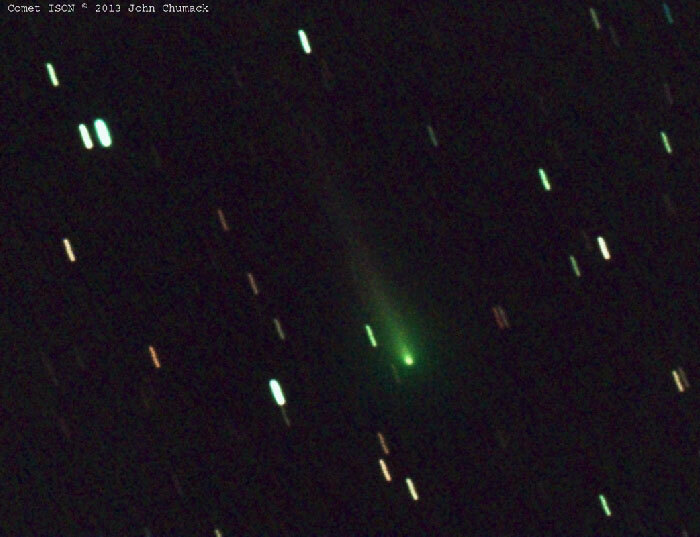 Comet ISON shows off its tail in this three-minute exposure taken on Nov. 19, 2013 at 6:10 a.m. EST, using a 14-inch telescope located at the Marshall Space Flight Center. 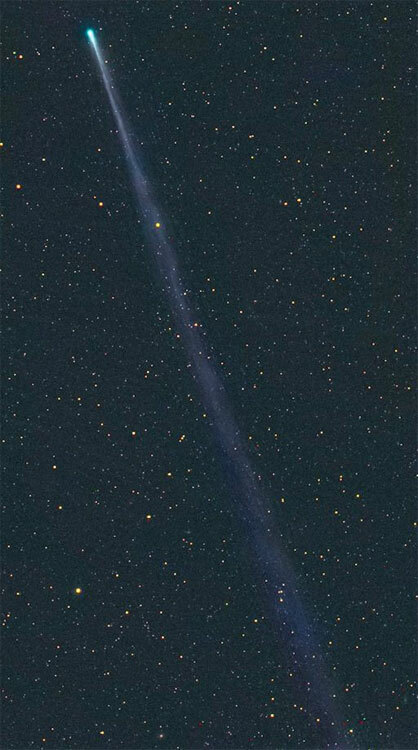 NASA astronomers have captured an amazing new photo of the brightening Comet ISON, an image that reveals the comet's intricate tail as it heads for a rendezvous with the sun next week. The new photo of Comet ISON was taken Tuesday (Nov. 19) by scientists at NASA's Marshall Space Flight Center in Huntsville, Ala., nine days ahead of the comet's Thanksgiving Day close encounter with the sun on Nov. 28. 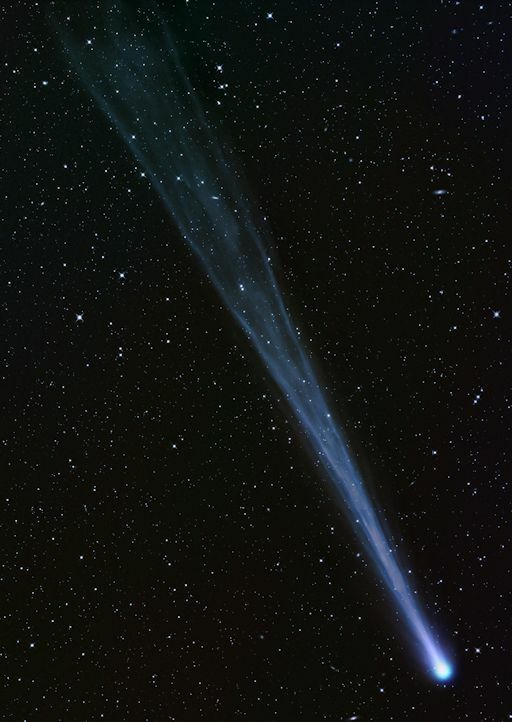 "Comet ISON shows off its tail …" NASA's image description begins. The comet photo was taken early Tuesday at 6:10 a.m. EST (1110 GMT) by Aaron Kingery at the Marshall center. He used a 14-inch telescope with a three-minute exposure time, according to the image description. SOLAR FLEET PICKS UP COMET ISON: Because NASA's twin STEREO probes are designed to observe the sun, they can see sundiving comets even when the glare becomes intense. 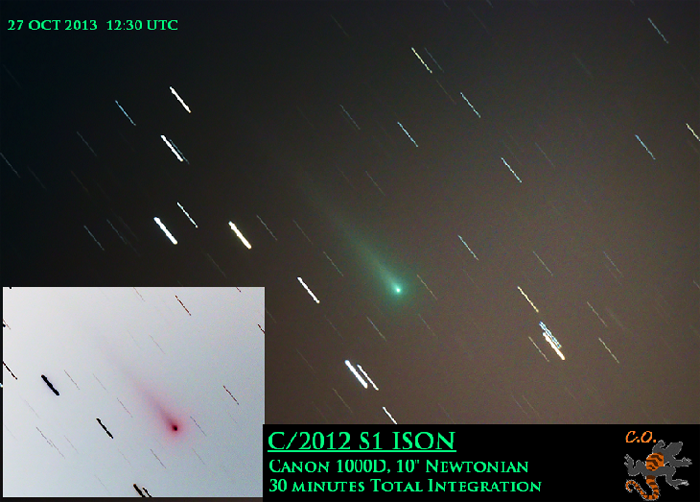 Yesterday, Comet ISON joined Earth, Mercury, and Comet Encke in the field of view of STEREO-A's Heliospheric Imager. "The dark 'clouds' of stuff you see coming from the right are density enhancements in the solar wind, and these are what are causing all the ripples you see in comet Encke's tail," explains Karl Battams of NASA's Comet ISON Observing Campaign. "I can pretty much promise you that we're going to see ISON's tail doing that in a couple of day's time, but on a much larger scale!" Battams points out another exciting development: Comet Encke and Comet ISON are converging for a photogenic close encounter. "No they're not going to hit each other - in reality they are millions of miles apart - but as seen from the STEREO-A spacecraft, they are going to get very close!" he says. "We are probably a couple of days away from seeing two comets almost side-by-side in that camera, with long tails flowing behind them in the solar wind. To say that such an image will be unprecedented is rather an understatement." Stay tuned for that. The latest movie from the STEREO-A spacecraft's Heliospheric Imager shows the comet over a five-day period from Nov. 20 to Nov. 25, 2013. Incoming comet ISON was obviously on a perilous path. The “dirty snowball” was on course to swing by the sun less than one solar diameter above the sun’s searing surface on 28 November, Thanksgiving Day in the United States. 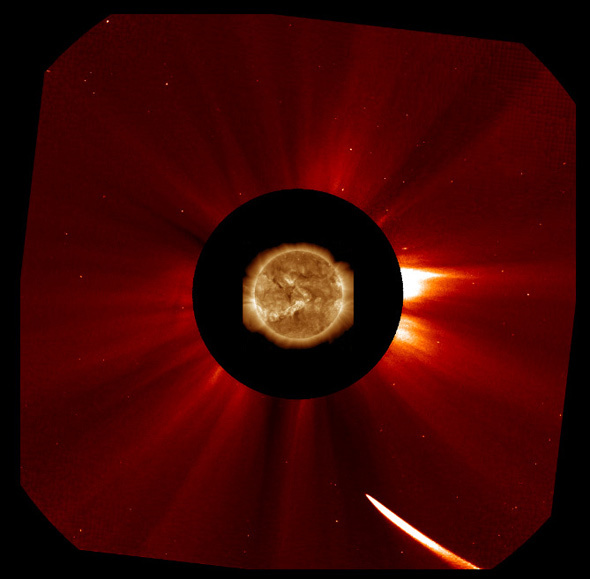 This view from the SOHO spacecraft dramatically illustrates ISON’s close passage through the sun’s streaming solar wind and around the sun (here inserted from another image to give a sense of scale). But astronomers are reporting ominous signs, such as a peak in overall brightness, suggesting that the shrouded ball of ice and dust at the center of the comet has broken up into nothing more than a cloud of dust. Direct confirmation of ISON’s disintegration must await spacecraft observations in the next few days. 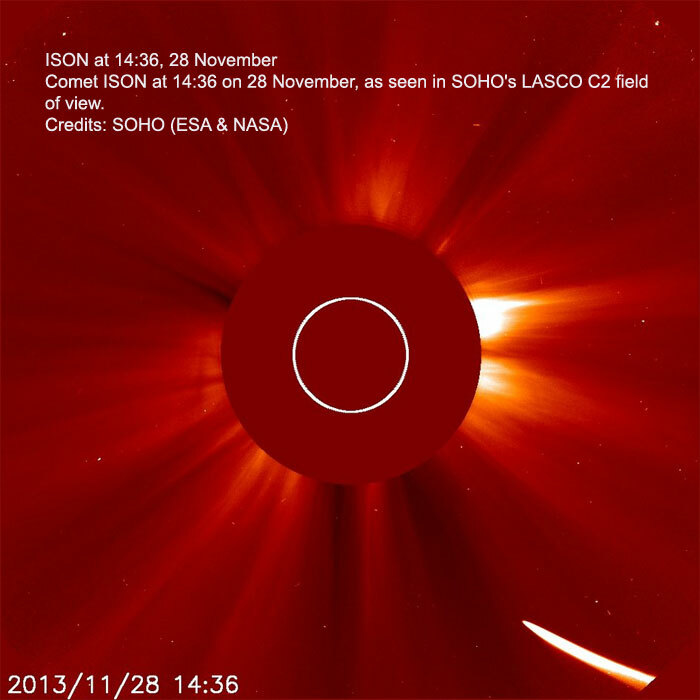 COMET ISON UPDATE: Comet ISON is brightening rapidly as it plunges into the sun's atmosphere. At closest approach around 1:45 p.m. EST on Nov. 28th (Thanksgiving Day in the USA), the comet will be little more than a million kilometers above the sun's fiery surface. Temperatures around ISON's icy nucleus could rise as high as 5000o F. No one knows if it can survive that kind of baking--but if it does, it could emerge as a splendid naked-eye comet in early December. 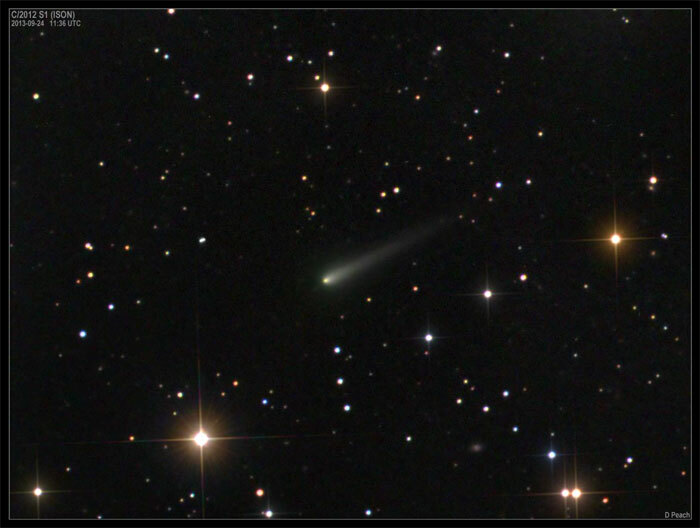 Over the course of the animation, Comet ISON brightens by a factor of at least four, and possibly as much as a factor of 10. It easily outshines the 1st-magnitude red giant star Antares to the lower left of the sun. 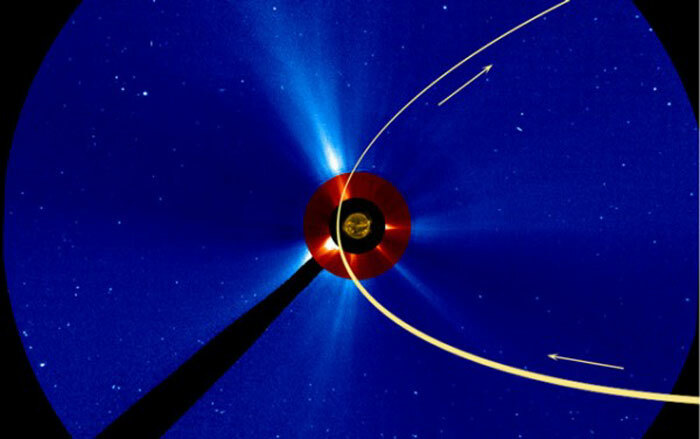 Researchers have been wondering what might happen if a CME strikes Comet ISON. They might find out before the day is over. As the movie shows, CMEs are billowing away from the sun in all directions. Avoiding a collision will become increasingly difficult as the comet moves closer to active regions on the sun's surface. Usually, SDO points straight at the sun. In this case, however, the observatory is being offset and moved three times to track the speeding comet. SDO images of sungrazing Comet Lovejoy in Dec. 2011 were dramatic. Comet ISON could be even better. The comet ISON and the Sun at 15:34 UTC today as seen by the SOHO spacecraft (the Sun image is from SDO, and added for scale). A wider view of the Sun and comet form SOHO, taken around the same time as the image above. Note how long the tail is! The star to the lower left is Antares, in Scorpius. NASA scientists say it appears that Comet ISON has not survived its close pass around the sun. UPDATE: It appears something survived; unclear yet how much. Amateur astronomers were hoping the comet would survive and become a spectacular feature of the night sky; some thought it had the potential to emerge from its encounter with the sun so bright that it could be visible during daylight hours. That apparently was not to be. 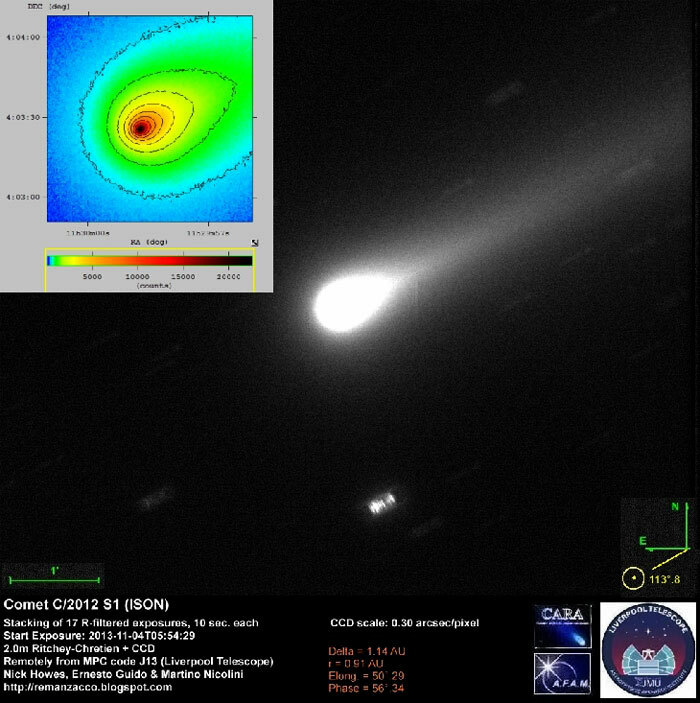 As the comet came within 684,000 miles of the sun this afternoon, it appears to have been ripped apart by the "insane" gravitational forces and vaporized by the heat, said Karl Battams, comet scientist for the Naval Research Laboratory, Washington, and solar spacecraft lead for NASA's Comet ISON Observing Campaign. NASA scientists were monitoring the comet during a live video this afternoon. Comet ISON appeared to break up as it approached perhelion - its closest approach to the sun - and various telescopes and instruments were unable to detect anything emerging from the other side of the sun on the path the comet was expected to exit. 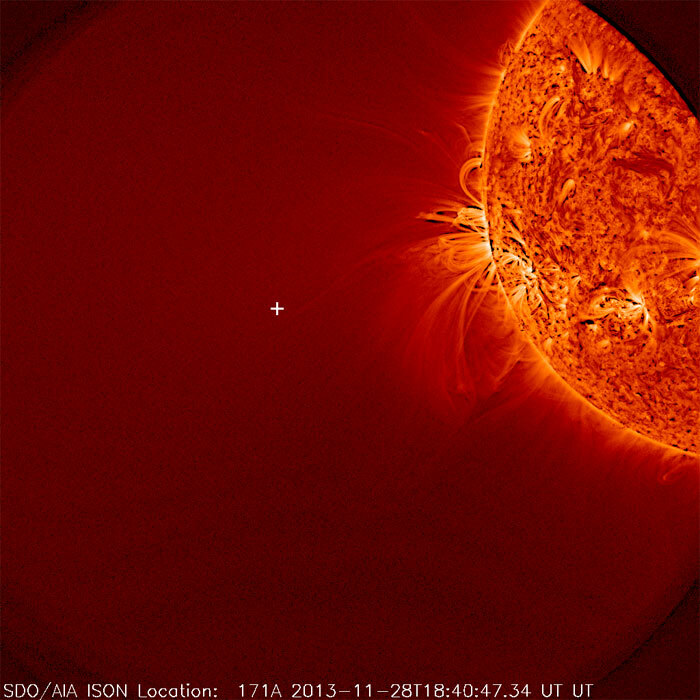 This image from NASA's Solar Dynamics Observatory shows the sun, but no Comet ISON was seen. A white plus sign shows where the Comet should have appeared. It is likely that the comet did not survive the trip. Comet ISON went around the sun on Nov. 28, 2013. Several solar observatories watched the comet throughout this closest approach to the sun, known as perihelion. While the fate of the comet is not yet established, it is likely that it did not survive the trip. The comet grew faint while.